Paraphrase on Rossini's "Largo al Factotum"
When a composer is extraordinarily prolific, there’s always a temptation to classify his achievement and stylistic outlook on the strength of a few well known pieces. This is certainly the case with the Italian-American Mario Castelnuovo-Tedesco whose chief claim to fame rests on the First Guitar Concerto and a number of other guitar works which are highly venerated by soloists throughout the world. 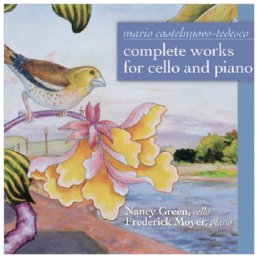 The overwhelming popularity of such compositions has inevitably led to the notion that Castelnuovo-Tedesco was primarily a composer of guitar music. Yet a brief glance at his varied output demonstrates this to be wholly misleading. Indeed Castelnuovo-Tedesco seems to have been interested in a vast range of genres, tackling both large-scale works such as operas, film scores, oratorios and concerti as well as piano miniatures, chamber music and song.